Tequesta & Keys The Tequesta occupied southeastern Florida from near present day Boca Raton southward to the Florida Keys. Well adapted to the Everglades and coastal wetlands, they traveled along the coast and into the interior Everglades by dugout canoes. 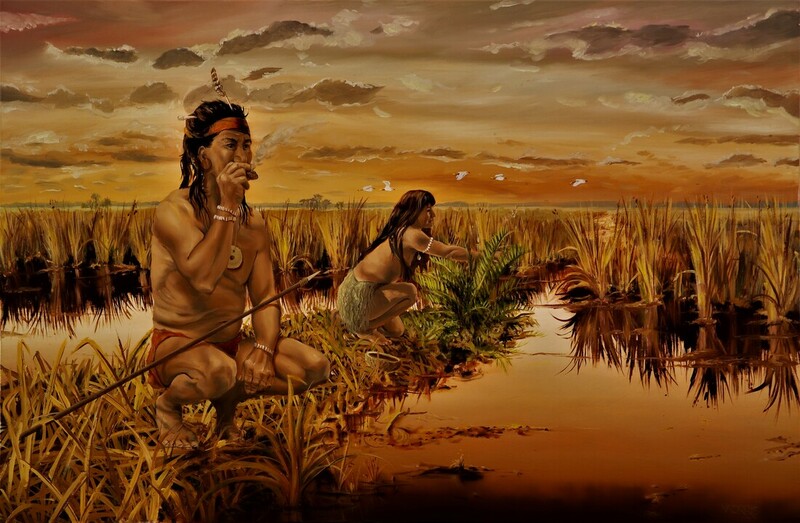 Archaeological evidence as to the origin of the Tequesta suggests that they had traveled from northern Florida, their ancestors likely canoeing southward from the marshes and lakes of the upper St. Johns River during the Archaic Period 3000 to 5000 years. 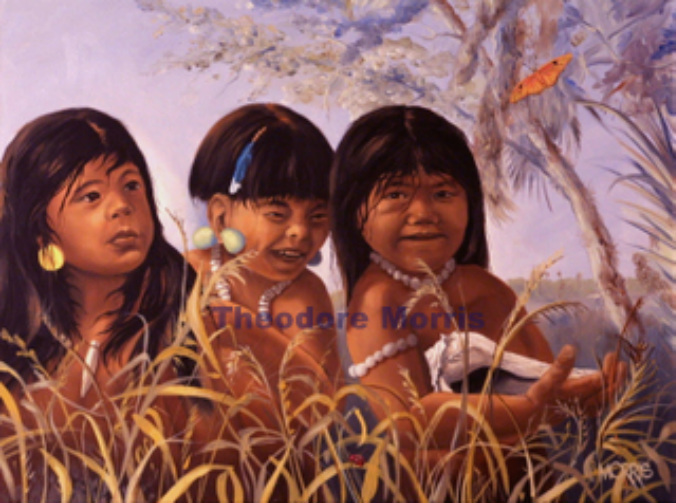 This likely northern origin is in contrast to a popular belief that Florida’s southern Indians had their origin from the Caribbean or the Yucatan in Mexico. Settlements tended to be small, likely never having more than 30 to 40 individuals, often representing several extended families. Larger towns were located on the coast, the largest of which was at the mouth of the Miami River. There it was possible for several hundred people to reside, the village population swelling at different time for ceremonies, trade, and important events. Other large villages were located on the New River in present day Fort Lauderdale, and within the Keys. Daily subsistence was fully adapted to a diversity of habitats ranging from the Everglades to coastal estuaries. Fish, by far, was the most important food source. Netting and fish traps in the Miami River and coastal estuaries yielded large volumes of mullet, catfish, sunfish, and gar. Offshore reefs yielded shark, parrotfish, jack, and sawfish. Other important marine resources included conch (Strombus gigas), collected on the shallow grassy flats. Other important gastropods and mollusks included whelk (Busycon) and horse conch. Brackish waters provided oyster. With this painting I wanted the viewer to experience the incredible beauty of south Florida and understand the rich marine resources available for this young boy. 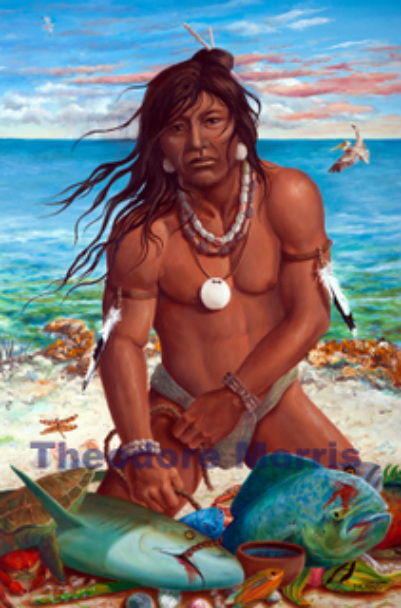 His face is based on my conception of Florida Indians as somewhere between the sharper angular face of North America Indians and the smoother faces of the South American Indians. I've contrasted his smooth brown skin with the intense light of the background. A hunter inhales wild tobacco nicotiana from his stone pipe as his wife examines the root of a coontie plant. The tuber (root) of this plant was ground into flour for bread and provided a valuable source of starch for the tribe. I painted the Everglades with rich colors to capture the beauty of this special place. I love capturing quiet moments of everyday life for these people. The grasses on either side move the viewer's eye to the middle of the composition. These Tequesta children are part of their coastal environment. Each child has its own personality as demonstrated in their individual expressions. I showed the atmosphere of playfulness with springy sea oats in the foreground. The muted pastel colors in the background emphasize the energy in the foreground. As dawn breaks, a Tequesta hunter stalks his prey in the bountiful Everglades. The Indians of Florida consumed all types of animals from their environment. Palm tree hammocks disappear over the horizon like a flotilla of ships. The painted loincloth designs are based on their pottery designs. The woman of the Tequesta and other tribes in Florida used the coil method for making pottery. After the pots were shaped and the designs impressed, the clay pots were taken to an open fire to be baked. It is not known for sure if these early peoples considered the clay sacred before the firing, but it is known that certain vessels used in religious practices such as funerary rites were considered sacred.